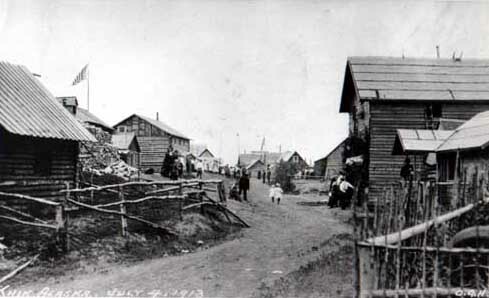 The Oscar Gill House in Knik, Alaska in 1913. The house is on the far right. The Oscar Gill House was built in 1913 in Knik, Alaska by pioneer Oscar Gill--Iditarod mail carrier, lighterage businessman, first Anchorage auto garage owner, three-term Anchorage mayor and Speaker of the Territorial House. Gill floated his two-story, clapboard-covered residence down the Knik River in 1916 and resurrected it in Anchorage's South Addition neighborhood. The "farmhouse architecture" of the Gill residence was unusual for the city. Oscar Gill came to Ship Creek in 1915 to work on construction of the Alaska Railroad. He and his wife, the former Emma Dohrmann, were familiar figures in South Central Alaska. They arrived in Seward in 1907 and moved to Susitna two years later, where they established a sawmill. With gold discoveries at Iditarod and Innoko, the Gills relocated to Knik, the trade center which served the interior of the state. Via his dog team, Gill became a mail carrier along the Iditarod Trail. Following the railroad boom, the Gills bought a one-acre home site in Anchorage's South Addition and had their Knik home moved and reassembled in that rural setting. Oscar Gill went on to establish himself as a prominent member of Anchorage's business community. From 1916 to 1923 he ran a lighterage business under contract with the Alaska Engineering Commission, transporting supplies to the docks at Ship Creek and to Knik. In 1923 he established an auto garage at the corner of Fourth Avenue and I Street, the first in the city. His political activities were varied: Gill served on the school board, the city council, and later served three terms as Anchorage mayor, from 1932 to 1936. 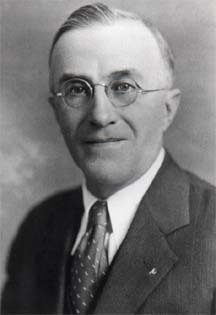 Gill was elected to the Territorial House, prior to Alaska's statehood, and served as Speaker of the Territorial House until his death in 1947. In 1928 Oscar Gill sold his home to Charles Peterson, a contractor for the Alaska Railroad. It remained at its location at 918 West 10th Avenue until 1982, when it was threatened with demolition due to expansion of the nearby Anchorage Pioneer Retirement Home. 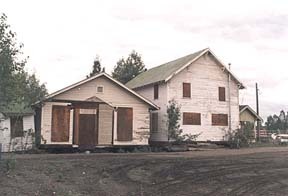 Along with two other significant pioneer homes, the Municipality of Anchorage purchased the Gill house in 1982 and moved it to a storage yard where it remained for 11 years. In May of 1993 Mark and Susan Lutz purchased the Gill house from Anchorage Historic Properties, a non-profit municipal entity, for $1 and relocated it back to an empty lot at 1344 West 10th Avenue, a short distance west of its original location. After extensive renovations to bring the structure into compliance with current building code requirements, the Oscar Gill House greeted its first guests in May of 1994.